Singapore: Why Isn’t The Government Giving Us Back Our Money? Leong Sze Hian wrote yesterday about how the “cash surplus” statistic has disappeared from the Monthly Digest of Statistics January 2014. This won’t be the first time that it has happened – they’ve done this with the wage distribution information from the CPF Annual Report as well. When too much dirt is dug up, you try other ways to hide the dirt. 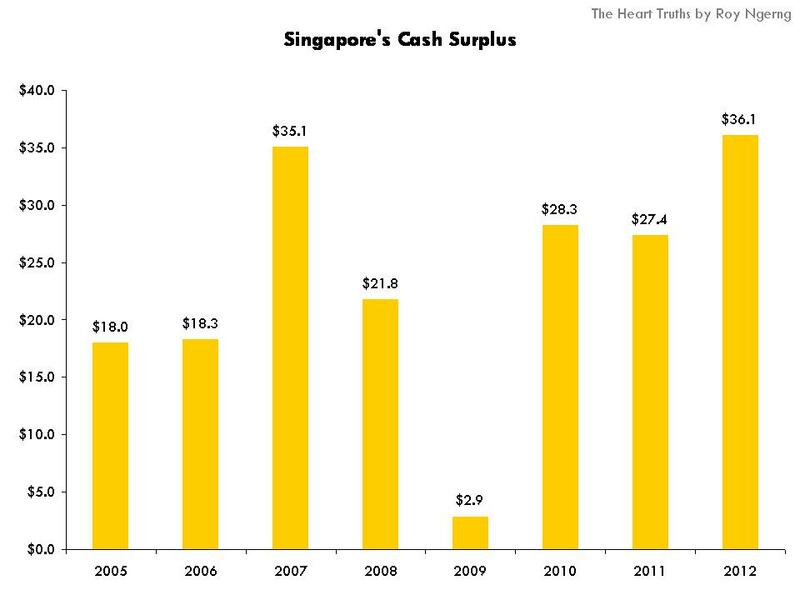 Moving along, Leong Sze Hian noted that Singapore has a cash surplus of $36.1 billion in 2012. 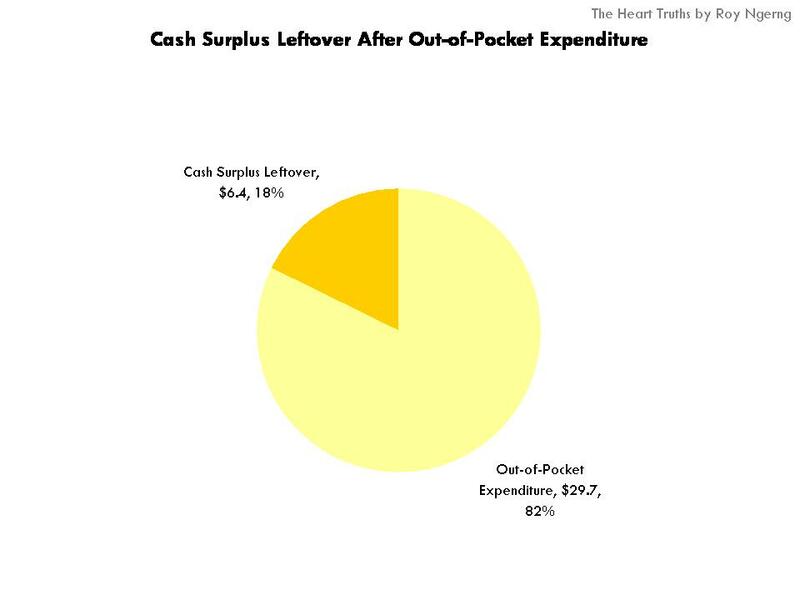 He also calculated that from 2005 to 2012, there is a cumulative cash surplus of $187.9 billion (Chart 1). 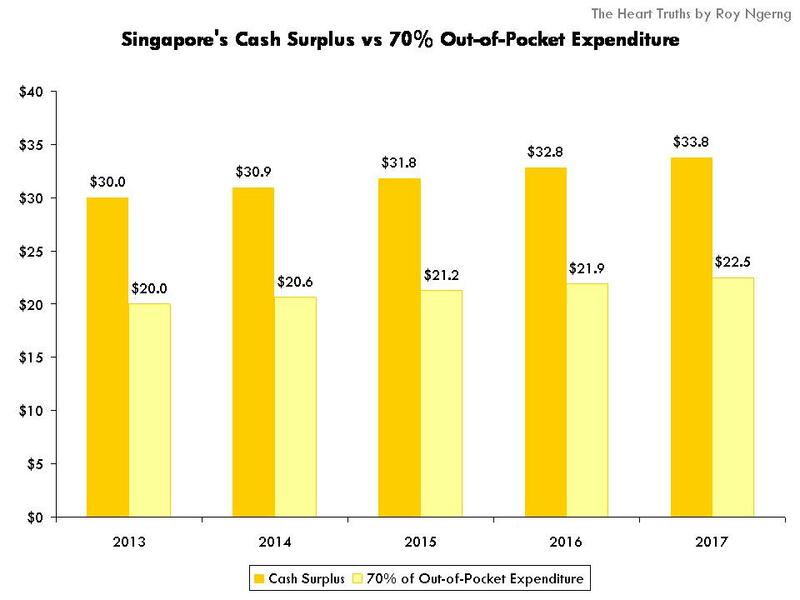 Chart 1: Leong Sze Hian Budget “cash surplus” statistics has disappeared? 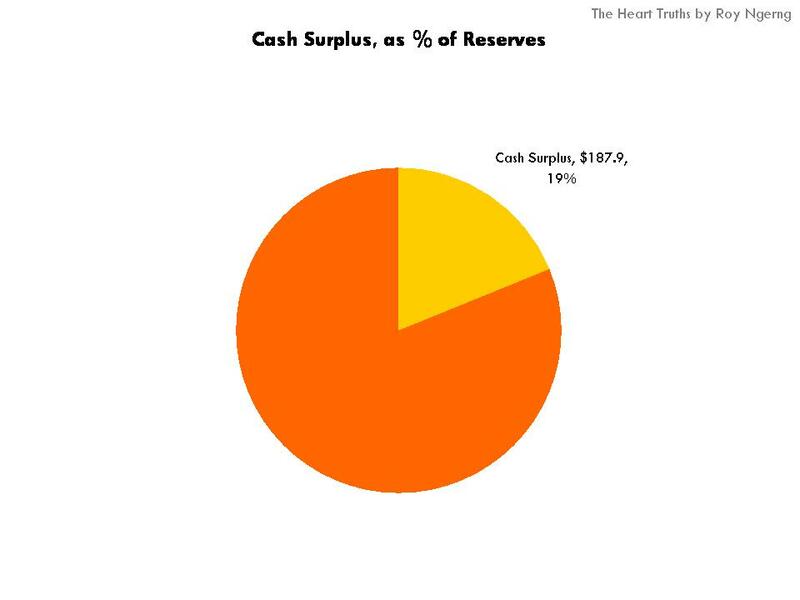 As I had written previously, Singapore has $1 trillion inside our reserves – this $187.9 billion would amount to 19% of our reserves (Chart 2) – a lot of money. Meanwhile, the cash surplus has risen in the billions over the past few years – Singapore is becoming richer overall – yet the poverty rate has risen as well. The poverty rate rose from 16% in 2002 to 26% in 2011. Assuming that the increase is constant, you would see that even though the Singapore government has gotten richer, Singaporeans however have gotten poorer (Chart 3). Can you see the pattern? 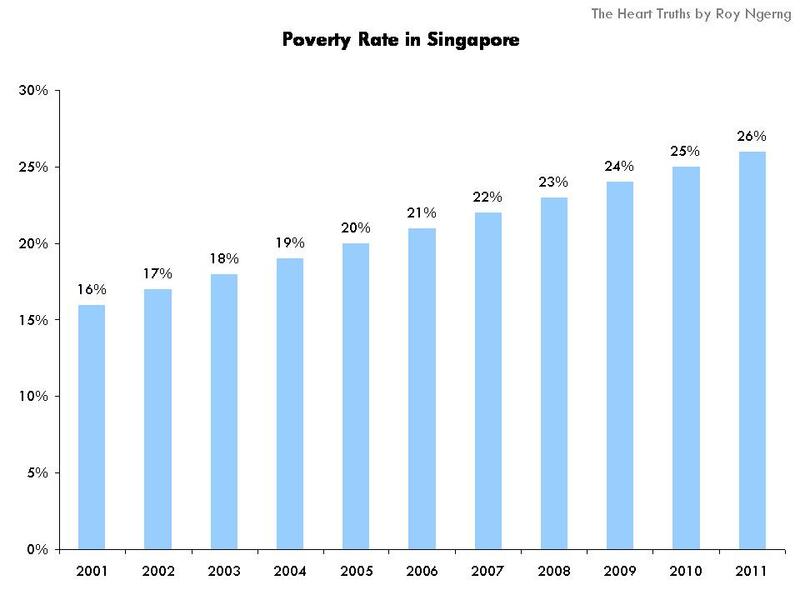 The government’s cash surplus is increasing, yet the poverty rate in Singapore is increasing as well. Something wrong here? Meanwhile, Leong Sze Hian and I have calculated that Singaporeans would spend about $29.7 billion out-of-pocket for healthcare, education and retirement. If the government were to give free healthcare and education to all Singaporeans and allow all Singaporeans to be able to retire at 65, this would still mean that we would have $6.4 billion leftover in surplus in 2012 (Chart 4). Even if the government was to foot only 70% of the total expenditure, or $20.8 billion, this would still give a $15.3 billion leftover in surplus. In fact, if we were to assume that the cash surplus would continue to be at about $30 billion every year on a 3% inflation rate, and the government continues to pay for 70% of the out-of-pocket expenditure for basic necessities, or $20 billion every year which grows on a 3% inflation rate, this would there would still be at least a $10 billion cash surplus every year (Chart 5). 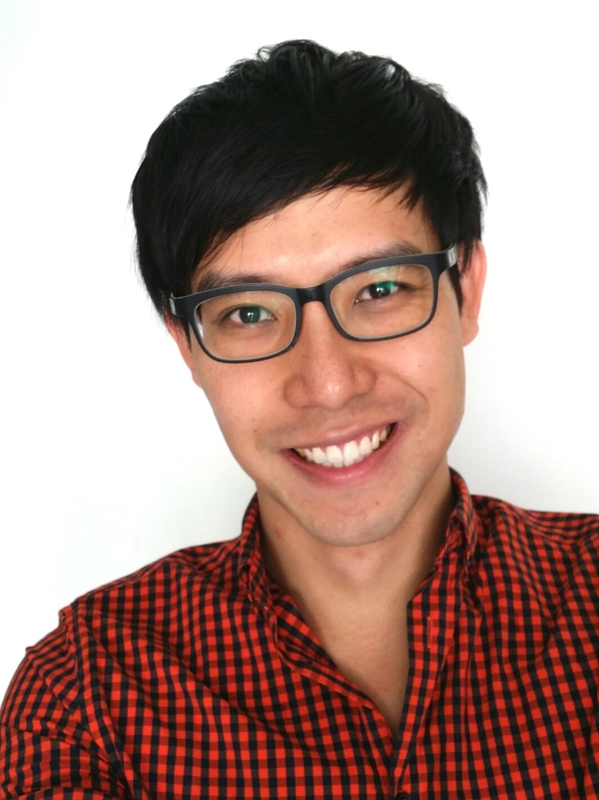 Not only that, Singaporeans would still be adequately protected and all Singaporeans would be able to access healthcare, education and retirement – we wouldn’t have the problem that we currently have now where many of the low-income would choose not to see a doctor or would not retire because they cannot afford it. Indeed, the income inequality in Singapore has been rising generally – which means that Singapore is becoming more and more unequal as a society. Not only that, the chart below will surprise you even more. If you look at the chart below, the green line shows you how the income inequality has grown over the years. Now look at the orange line – this shows you how the wealth of the richest 10% in Singapore has also grown – by 2011, the richest 10% in Singapore owns 42% of the share of income in Singapore! Almost half the income in Singapore is owned by only the richest 10% in Singapore! 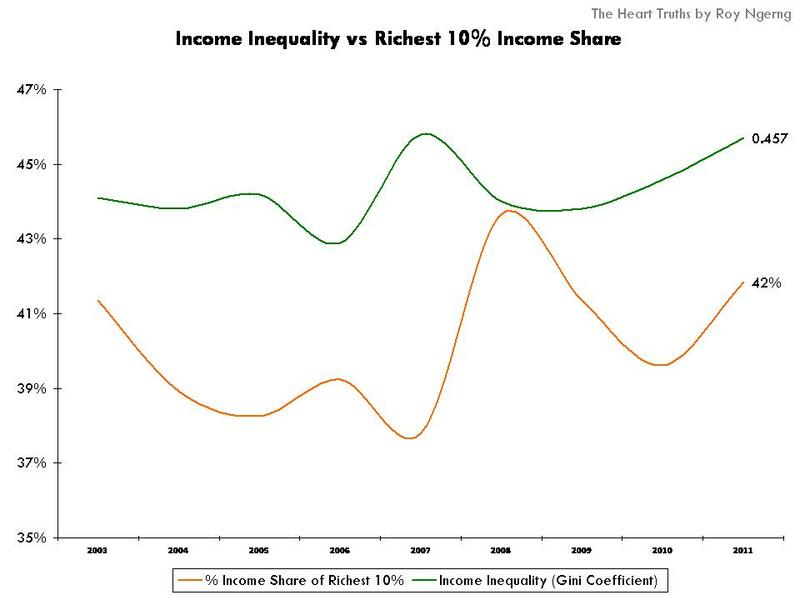 But more importantly, can you see that the richest 10% would always see their share of income rise, following the rise in income inequality in Singapore? Do you know that the Singapore Prime Minister belongs to the richest 0.1% and the PAP politicians belong to the richest 5%? What we have here is only half the story. As Leong Sze Hian and I have written in our 10-part article and in this article today, we have already shown you that there is enough money in Singapore to ensure that all Singaporeans can be protected, without even having to increase taxes – however, why is this not happening? Where are the taxes that we are paying going to, if not for us? Now, you can also see that as income inequality increases, the rich in Singapore gets richer and richer, while the poor in Singapore languishes. Meanwhile, the PAP ministers and politicians are themselves getting richer and richer. Do they even understand the pain and suffering that the low- and middle-income Singaporeans have to go through? Thanks! 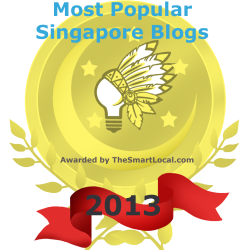 After reading your many posts, I hate Singapore even more and ashame to be singaporean. The Gov has made the poor even poorer and the rich are becoming richer. Lower-income got more in Govt transfers than their earned income? [Video] Singaporeans Are Paying High Taxes!